Injuries to the eyes are very serious and often can be hard to treat. The eye is a very delicate organ and the bone and muscle structure around the eye can easily be damaged. Injuries to the eyes can lead to changes in physical appearance of the face, changes to vision, and possibly blindness. The most common injuries that occur to an eye are objects that pierce the eye during a fall or in an accident. The second leading cause of eye injuries is blunt trauma that causes damage to the eyes or the orbital socket area surrounding the eyeball. Blunt trauma to the eye is commonly associated with a slip and fall incident or being hit in the face during an altercation. According to a report that was presented to the American Academy of Ophthalmology in 2015 conducted by research students at John Hopkins University, over 45,000 serious eye injuries occurred during the previous 10 years. This study only recorded information about eye injuries that required emergency hospital care. Information in this study showed that there were over 8,000 eye injuries attributed to blunt trauma to the eye caused in a physical altercation. In people age 60 and over, almost 8,500 eye injuries were recorded during a slip and fall event. Eye injuries from falling down stairs were recorded nearly 1,000 times. Other injuries included having an object enter the eye. Of these events, the leading cause of having an object enter the eye was during a fight, followed by shrapnel during a vehicular accident. Childhood accidents while carrying sharp objects came in last place.. 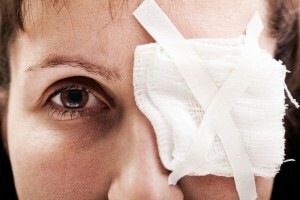 Recent studies by the insurance industry reveal the leading causes of injury claims related to damage to the eyes. Overall, the leading causes of eye injuries were physical confrontations (fighting or being attacked) and slip and fall accidents (i.e. brawls and falls). California Civil Code 1714 states that an owner of a property, private or public, has the responsibility for keeping the property safe for anyone that enters that property by invitation. What this means is that a person or business owner is obligated to make their property safe for you to use if they “invite” you to that property. Inviting can mean everything from a personal social call to being open to the public to conduct business. Keeping the property safe means that it should be free from objects that may cause you harm, including things that could hamper your ability to walk, such as broken pavement, loose rugs or tiles, or cluttered pathways. It also means that the property owner has a responsibility to keep the property well-lit and protected by security measures if necessary o ensure that visitors are safe. • The parking lot was not properly lit to protect visitors. • The area is known as a high crime area and proper safety devices, such as CCTV or even a security guard was not posted to protect visitors. • The landscaping around the parking lot was kept in a manner making it easy for a person to lay-in-wait and attacks someone in the parking lot. Any injuries sustained by that person in the parking lot are the responsibility of the business owner under California Premises Liability Laws. • The property owner failed to maintain the walkways in a manner that is safe, such as eliminating cracks and holes in the pavement and keeping walkways well-lit. • Property owner fails to maintain stairs and elevator areas to ensure the safety of all those who use these devices to move from one floor to another. • Debris and other clutter is left intentionally in walkways which causes the visitor to have to walk in abnormal patterns to avoid the debris, leading to a fall. Premises liability is a very broad law and anyone who has been injured while visiting a property not their own may be entitled to receive compensation. If you have received an eye injury as the result of a negligent act of another person or entity, you are encouraged to speak with a personal injury attorney about your rights to seek compensation for your losses. Your attorney will explain to you the types of compensation that you can seek under California law and the provisions of the insurance policy covering the event. Your attorney will protect your rights as a victim of negligence and seek full and complete compensation on your behalf from the responsible party.